It's here - or at least it nearly is: Apple's latest and greatest iPhone, the iPhone 5S ships on the 20th of September. It might look like an iPhone 5, but there are stacks of improvements: it's the smartest, most powerful iPhone that Apple has ever made. Here are the seven things that you're going to absolutely love about it. While the cheaper iPhone 5C makes do with Apple's A6 processor, the iPhone 5S benefits from the most powerful processor Apple has ever put into a phone. 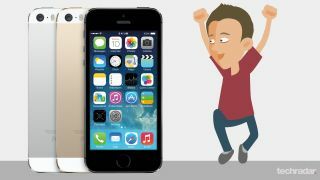 The iPhone 5S has the brand new A7 processor, the first 64-bit processor to power a smartphone, and that means it's twice as fast as its predecessor. Apple says that the iPhone 5S's performance is 40 times faster than the original iPhone, and its graphics performance is an incredible 56 times faster - and while you should always take manufacturers' figures with a hefty dose of salt, there's no doubt that this is the fastest iPhone ever made. The A7 isn't the only new chip you'll find inside an iPhone 5S. There's a new motion co-processor, the M7, and it's designed to do something very useful: it continually monitors movement, so for example it can track your steps while the main processor sleeps. That's great for several reasons: it enables a new generation of health and fitness apps to track what you do each day; it can tell your iPhone whether you're sitting, walking or in a vehicle and tailor apps accordingly; and it can do its monitoring without having to power up the main phone - so you get all the benefits of smartphone fitness apps without any of the battery drain. Apple has opened up the M7 processor to app developers, so we should see all kinds of interesting new apps - not just fitness ones, but apps that use the M7's senses in interesting ways. Previous iPhones - and many rivals - make do with a single LED flash, but the iPhone 5S has two. Apple calls it a "true tone flash", because that sounds more interesting than "twin flash", but what it does is very useful: it has one cool white LED and one warm amber one, and it can mix the light from the two flashes to get the right colour balance. Where normal flash photos tend to look like the subjects have just been dug up, true tone flash photos should look much more realistic - and a lot more flattering. The iPhone 5S has a brand new camera, and it's clever in all kinds of ways. The lens is a new, five-element lens of Apple's own design, boasting an impressive aperture of f2.2. That means it's good for low light, as does the improved backside illumination that makes the sensor perform better in dim lighting. The sensor itself is 15 percent bigger, which improves picture quality, and the camera software has been updated to take full advantage. It automatically sets the white balance and exposure, takes multiple photographs and chooses the best, and you can shoot using the new burst mode and slow-mo modes. The camera can also record HD video at 120 frames per second. Fed up with fiddly PINs and passwords you can never remember? Why not give your phone the finger? The iPhone 5S's home button contains a fingerprint sensor, which Apple calls Touch ID. It scans and securely stores your fingerprints, and you can then use the sensor to unlock your phone and to approve iTunes purchases. In the long term, app developers might use fingerprint authentication for their own apps - so you might approve payments with your fingerprint rather than a crackable password. Apple's iWork apps are superb tools for home and business use alike, and every iPhone 5S buyer gets the lot for free: presentation program Keynote, word processor Pages, spreadsheet app Numbers, image editor iPhoto and video editing app iMovie. That A7 processor should mean they're silky smooth no matter how big the projects you throw at them. The iPhone 5S also runs iOS 7, the latest and most useful version of Apple's mobile operating system. As much as we like the brightly coloured cases of the iPhone 5C, when we're dropping serious money on a smartphone we'd prefer not to end up with something that looks like it came from Toys 'R Us. The anodised aluminium of the iPhone 5S comes in three distinctly sober colours: silver, gold and what Apple likes to call "space grey". Even the gold one looks relatively restrained, especially when you compare it to its sibling's exuberant neon hues. Where the iPhone 5C is a phone to make you smile, the iPhone 5S is a phone to take seriously.